To enhance the physical, mental, and social well-being, while reducing fall risk for seniors, and persons with disabilities in Stanislaus County, in a collaborative community effort through advocacy, education, coordinated services and best practices for independence. In Stanislaus County there are over 103,113 individuals 60 years of age and older, which makes up a little over 19% of the total population. Nearly 40% of the 65+ population are economically insecure as measured by the Elder Economic Security Index. In another 15 to 20 years, this figure will increase dramatically reflecting a continued increase in the aging demographics. Because many older adults and adults with disabilities choose to live independently and engage in their community for as long as possible, we need to collaborate now to create appropriate supportive services. 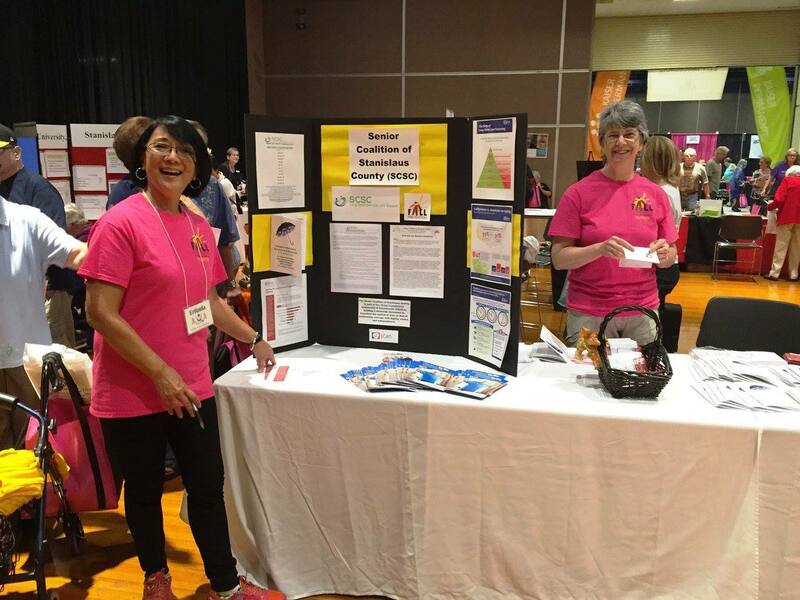 The Senior Coalition of Stanislaus County is a working group of organizations and individuals working collaboratively to provide education and leadership to create awareness of senior issues around Fall Prevention and Long Term Services and Supports Systems (LTSS) in Stanislaus County. LTSS refer to a wide range of personal, medical and social/financial assistance needed by persons with functional limitations over an extended time. The services may be publicly or privately financed, delivered in a wide range of settings and may change as the needs of the individual who uses the services change. The Senior Coalition is comprised of over 39 individuals representing 34 organizations and has a reach of 18,000 dual eligible persons in Stanislaus County. Dual eligible persons are those who qualify for both Medicare and MediCal services. The Senior Fall Prevention Coalition was formed in 2007 to focus on issues around Fall Prevention for seniors and/or disabled persons 65+ in Stanislaus County. In 2012, we expanded the Coalition priorities to include issues around Long Term Services and Supports Systems and changed the Coalition name to Senior Coalition of Stanislaus County. We are committed to making Stanislaus County a livable community for all of us as we age. With the growth of the aging population, we need to plan for the increase in demand for services and support systems to insure we meet the needs of the frailest, vulnerable, and homebound seniors and disabled individuals. Public agencies and elected officials must examine how prepared their institutions and infrastructure are to respond to this demographic shift and plan accordingly. The Senior Coalition of Stanislaus County is part of The SCAN Foundation’s Community of Constituents initiative, building a statewide movement to transform the system of care so that all Californians can age with dignity, choice, and independence. Strategic plan: implementation that includes recommendation to guide improvements in the organization, availability and financing of LTSS. Continue to raise awareness of fall prevention resources available in the community. Conduct and coordinate fall prevention activities through Annual Healthy Aging & Fall Prevention Summit. Build an infrastructure that will sustain the work of the coalition. Support an effective, statewide social movement toward transforming the state’s long-term services and supports system. Improve the Coalition’s ability for social action in Stanislaus County – specifically focused on policy issues around a high-quality, cost effective system of LTSS. Educate and communicate stakeholders to advance the ​Policy Agenda. Bridge the gap and build partnerships, with a focus on inclusion, between organizations and advocates for seniors and persons with disabilities. The coalition provides an opportunity to interact with others who are committed to addressing serious public health issues. By working together and supporting one another, we can enhance our individual efforts and have a greater impact in the community. As a coalition with a strong membership that is focused on the problem, we are more likely to be able to sustain our efforts and attract future funding. Actively participate in monthly coalition meetings with 70% meeting attendance. Be willing to commit, to the degree possible, her/his organization’s resources to support the coalition and its activities. Participate in committees that are a good match for her/his talents and her/his organization’s mission.